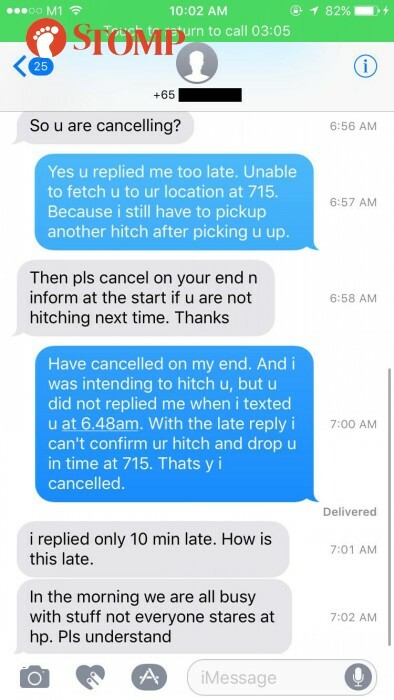 A GrabHitch driver had two misunderstandings with two passengers on the same day (Oct 9) at 6.25am and ended up fetching up none of them. 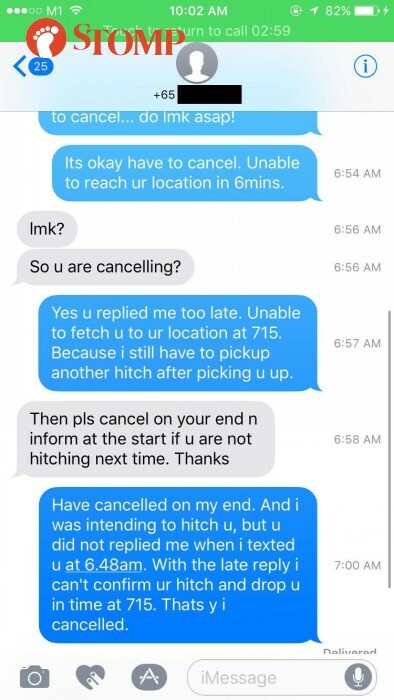 The first passenger called her "selfish" and "irresponsible" due to cancelling a booking yesterday at 6.36am. The other told her to "cancel the booking on her end, and inform the passenger from the start if she was not going to pick them up" at 6.58am. 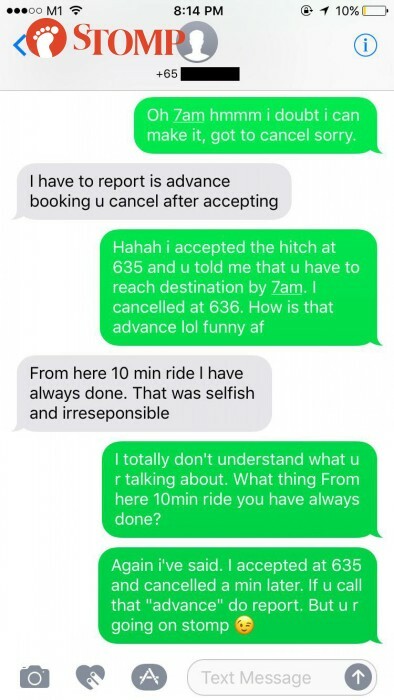 The driver, Stomper Patricia, sent in screenshots of her conversation with the two passengers. Patricia said she was at home getting ready when she accepted the bookings at 6.25 and 6.35am respectively. She accepted the bookings to make a few dollars from the rides. 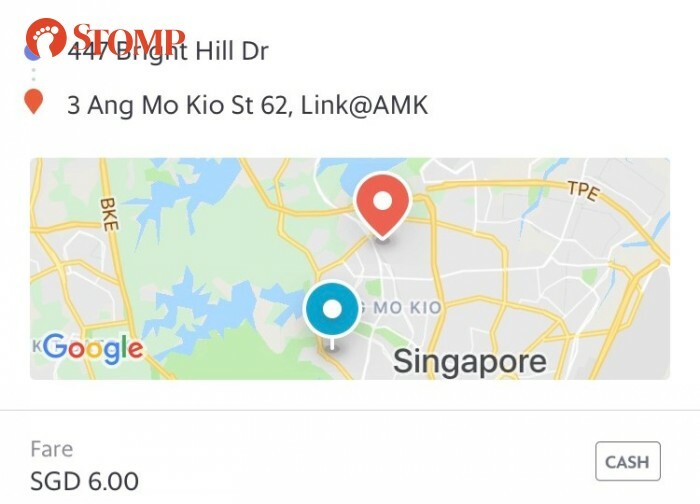 She was heading to a McDonald's in Ang Mo Kio from Sin Ming Road. The first passenger informed her that she wanted to reach Link @ Ang Mo Kio at 7am from Bright Hill Drive. Patricia told Stomp she estimated that she would have to pick the passenger up at 6.45am, which gave her 10 minutes to get ready. Patricia cancelled the booking immediately because she knew she could not fetch the passenger in time. The passenger then said that she had to report Patricia for cancelling an "advance booking" after accepting it. Patricia explained and replied: "I accepted the Hitch at 6.35am and you told me that you had to reach the destination by 7am. I cancelled at 6.36am. How is that advanced?" The passenger then replied saying that she has always taken 10-minute rides from her location and called Patricia "selfish" and "irresponsible". Patricia then had to face the other passenger, at the same time. Patricia had confirmed the booking and contacted the passenger at 6.25am. At 6.35am, she asked the passenger if she minds sharing the ride. The passenger replied two minutes later at 6.37am with: "Is it an adult? If it is a student, yes." Patricia told Stomp: "I felt uncomfortable checking with the other passenger if she was a student or not, so I sent the next text message." 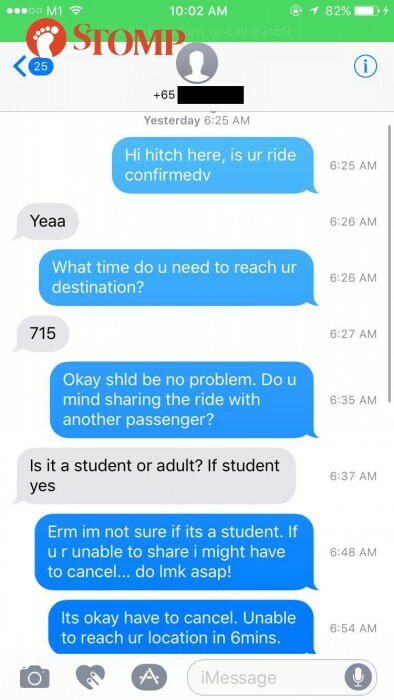 The message sent at 6.48am said: "I'm not sure if the passenger is a student. If you are unable to share, I might have to cancel. Do let me know as soon as possible!" At 6.54am, six minutes later, the passenger had not replied and Patricia texted: "It's ok. I have to cancel. I am unable to reach your location in six minutes." The passenger replied two minutes later asking if Patricia had cancelled. Patricia explained her situation to the passenger. The passenger ended the conversation with: "In the morning, we are all busy with things. Not everyone stares at their handphones. Please understand." In the end, Patricia ended up skipping the drive to McDonald's altogether and cooked herself some instant noodles at home.